Begin Again was once called Can a Song Save Your Life? Most audiences will probably figure out the film’s answer to that question in short order. 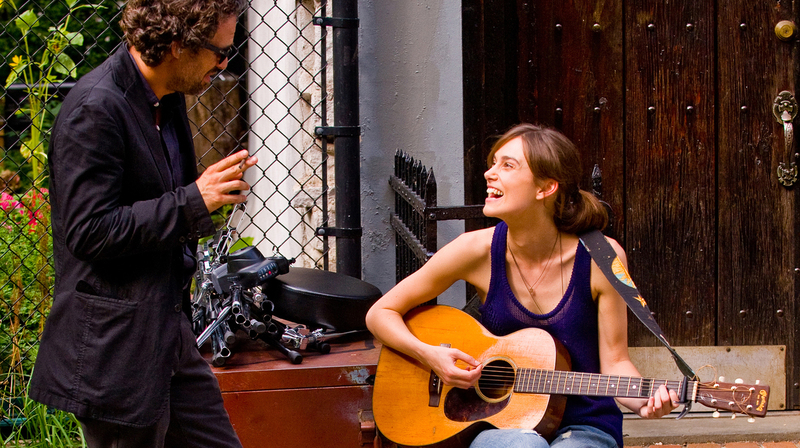 Writer/director John Carney’s latest proves again that music, like good food, is irresistible onscreen. The film is simple and earnest. It flows with the even pace of a relaxing summer song. Carney opens his film in a dimly lit bar as a shy singer named Gretta (Keira Knightley) reluctantly takes the stage at an open mic. A scruffy-looking man (Mark Ruffalo) watches her as he nurses his drink. She plays a quiet song, her gentle voice accompanied by a single acoustic guitar. No one pays much attention, but the man at the bar is mesmerized. She finishes, looks down and shrinks into herself. The man looks out at her with a glimmer of renewed hope in his eyes. Then, like an artist recording another take in a studio, Carney starts over. The film cycles back on itself to fully introduce the man at the bar. He is Dan Mulligan, a struggling New York City producer. He sips from a flask as he listens to the morning’s new demos, searching for that hidden gem, and tosses all the CDs he doesn’t like out of his car window. He loses his job at the label he co-founded, becomes estranged from his wife, Miriam (Catherine Keener), and struggles to relate to his teenage daughter, Violet (Hailee Steinfeld). One drinking binge later, he’s sitting in the bar, wallowing over the hand he’s been dealt. Ruffalo lends the character and the sequence a gruff charm. We want to see this man succeed. We want him to find that elusive sound. When he finds it at that open mic night, magic happens. Dan arranges Gretta’s song in his head, as piano, drums and cello all become animated and play themselves onstage. The scene uses effective visuals to inform Dan’s talents as a producer. Gretta’s own history is detailed through a more conventional flashback later in the film, but that moment doesn’t feel heavy-handed, either. The extended sequence transitions naturally in and out of the main narrative. The repeated opening and long flashback would feel strange in a typical comedy-drama, but Begin Again is atypical. This structure avoids overt exposition in the first act. Instead of telling how Gretta and Dan’s respective struggles came to pass, Carney shows their circumstances develop in a clear way. The director, best known for 2007’s Once, knows how to integrate music into film. After Dan’s business partner refuses to give Gretta a recording contract, Dan convinces her to record an album on the streets. The film takes on a giddy energy as they scour the nooks and crevices of the city to round up session musicians. 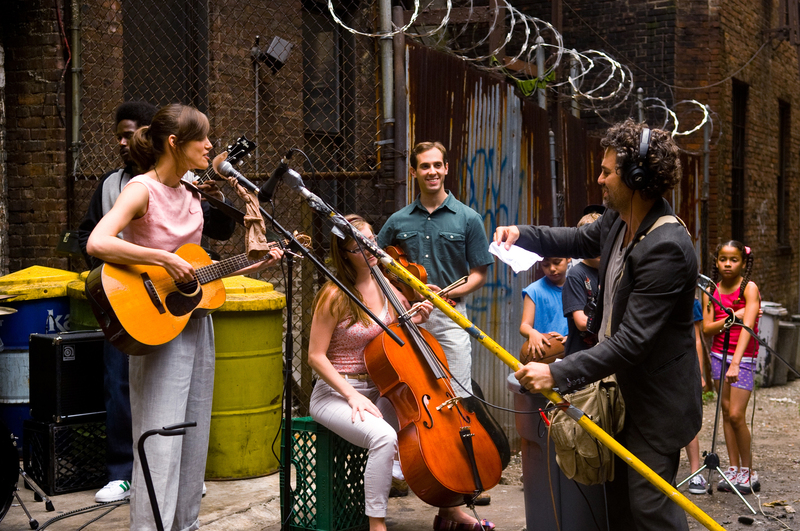 Begin Again is about the love of creating music. Live recording scenes are passionate and joyous. It’s exciting to see creation happening in a little slice of the city, the slightest burst of color against the concrete jungle. Knightley reveals herself to be easy on the ears. Her delicate voice works well in songwriter Gregg Alexander’s simple, organic tunes. 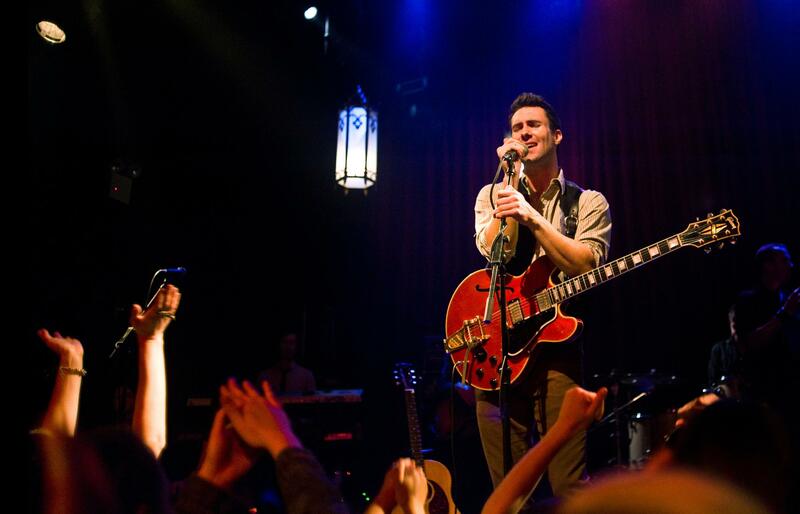 It also helps to have Adam Levine, of pop-rock fame, in the cast. Levine plays Dave Kohl, a rising musician and Gretta’s ex. They used to craft intimate songs together, but he embraced his growing fame (and ridiculous beard) and left her behind. The dissolution of their relationship underlines the conflict between commercialism and artistry. Levine delivers an honest, natural performance. Watching him grapple with these industry extremes is unforced and convincing. Not every part of the film works as smoothly. Dan remembers his daughter, Violet, just as I started to forget her. Conveniently, Violet can play guitar (Steinfeld also performs the parts herself) and of course Gretta takes the budding musician under her wing. Violet’s reintroduction to the plot feels shoehorned. However, it also allows for reconciliation between father and daughter. This affecting moment takes place when Dan picks up a bass and joins Violet in a rooftop recording session. The scene drips with schmaltz, but it is a fitting conclusion to their emotional arc. Other supporting players are slighted. Keener is boxed in as the bitter wife while James Corden is only allowed to provide comic relief as Gretta’s tough-loving best friend. Carney also gives several characters identical backstories. By the third time we find out about yet another character’s broken romance with a musician, it feels grating. That said, Begin Again is sincere and heartfelt, and its narrative strengths outweigh its shallower elements. Despite the contrivances, I still listen to the soundtrack regularly, and that’s an effective testament to the film’s allure. Sometimes it’s best to just let yourself get lost in the music.